Sequel: Oneechan ga Kita: Hajimete no… Kitaa! Ever finished something and thought "wait... what did I just watch again?" . Well that's precisely the feeling this title convey. No real story to speak of. The 3 min runtime follows along the same vein of: Ichika obsesses over Tomoya, Tomoya is slightly weirded out, but he grows to like her ... rinse and repeat. I kid you not, that's it.. nothing more, nothing less. It's something that leaves no impact, as it is quickly forgotten moments after completion. No attention to detail. Everything feels like it was just copied and pasted from the countless of other generic school romps. The character design also lack originality. No sense of depth, texture, cinematics or anything that makes a decent anime experience. There's virtually none to speak of. Just your generic "fluffy" sounds. The voice actors were fine, none leaving an impact however. They're all archetypes. With that being said you've seen this one note cast countless of times. and the rest follow this pattern, either existing for the sole purpose of being a comedic gag or just filing in a archetypal role. It's hard to enjoy something that you forget within the span of time it took to finish write this review. If you've seen enough of these slice of life/school setting anime then this won't bring anything new to the table. I can't say this is a waste of time seeing that it's only slightly longer than your standard 25min episode runtime. If you have nothing else to do and have 30mins to kill then by all means knock this one out. For those wanting a quickie review I'll Keep this short and sweat for you guys. If you are wanting a nicely styled, funny Anime, with a hilarious bro-con Sister, that you can blast through really quick while enjoying regular laughs then Onee-Chan ga Kita is perfect for you. Although i'm not a huge fan of incestuous relationships, this anime does it right by not forcing it in your face. It's kept simple and sweet. It reminded me of a short, wackier, yet less perverted version of Kiss X Sis. Although all the characters have their own positive and negative aspects, Mizuhara MAKES this anime, she is a riot, she never failed to make me smile and laugh. She gives this anime it's feel. She alone makes this anime a 10/10 for characters. I came into this anime not expecting much due to the 3 minute episode length. But after blasting through all episodes in 1 sitting i was left yearning for more. It made me laugh on a regular basis without being just another stupid anime with some laughs. It still had some lovely moments of that Sisterly love. As i mentioned at the start i recommend this anime to anyone who wants a quick light hearted funny anime. And i especially recommend it to anyone who was a fan of Kiss X Sis. Honestly, this anime was pretty funny. This isn't the type of anime that's serious, and all that. But if you're looking for an anime that's funny and short, and crazy i'd definitely reccomend this anime to you. If you're looking for a more serious anime, i'd definitely not reccomend you this one. But you should definitely check this anime out. Yes, despite the 3 minute episodes and only having 12 episodes, the story actually somewhat stays on track, it's not too good, but it's pretty funny. It's a bit weird, but unique and enjoyable. The opening and ending was cute, nothing wrong about it. Yes, despite the episode length it actually did he some character development. ALERT: If you're planning on watching this anime and see my score as a 6, don't stop planning. Because a 6 for me is actually pretty good. Onee chan ga kita is a silly and bright anime! It made me laugh at some points! The story is veryyyy simple, it's about a sister who is obssesed to her brother. I liked the story, it's not THAT complex. But it's overall enjoyable to this kind of anime. The art is actually very clean and fresh, not A "BEAUTIFUL MASTERPIECE!" but somewhat cute. Meh, the sounds aren't the most important part of the anime. They are fair too me. Not good but not bad. The characters are developed well... but not very well. The protagonist seems a little...normal and/or clíche? Or it's just me, but I have nothing to complain with the others. 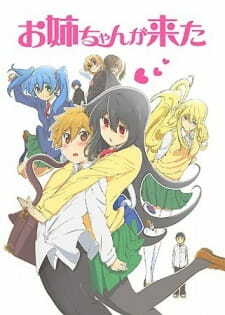 Onee chan ga kita it's a fun, short, simple and fresh anime with a good story, cute art, meh sounds, good character devlopment and could take a big laugh out of you, I will rate it as 8/10!